A new collection of Holmes stories by Lyndsay Faye, author of Dust and Shadow. 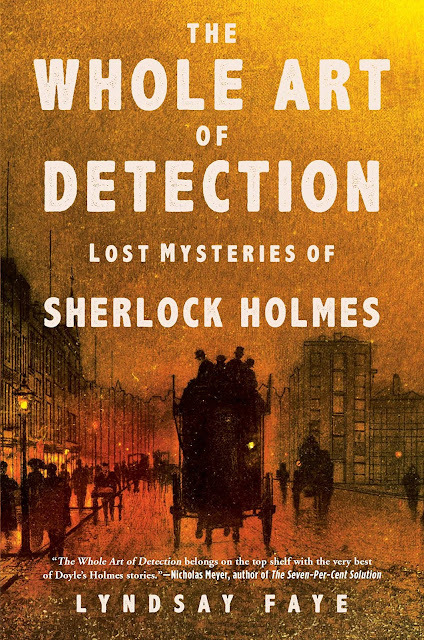 Lyndsay Faye’s best Holmes tales, including two new works, are brought together in The Whole Art of Detection, a stunning collection that spans Holmes’s career, from self-taught young upstart to publicly lauded detective, both before and after his faked death over a Swiss waterfall in 1894. In “The Lowther Park Mystery,” the unsociable Holmes is forced to attend a garden party at the request of his politician brother and improvises a bit of theater to foil a conspiracy against the government. “The Adventure of the Thames Tunnel” brings Holmes’s attention to the baffling murder of a jewel thief in the middle of an underground railway passage. With Holmes and Watson encountering all manner of ungrateful relatives, phony psychologists, wronged wives, plaid-garbed villains, and even a peculiar species of deadly red leech, The Whole Art of Detection is a must-read for Sherlockians and any fan of historical crime fiction with a modern sensibility.